At the beginning it should be remembered that the release of version 5.0 was postponed dozens of times. The reason was a lot of bugs, lack of compatibility and general confusion around the new editor. But it happened and we have WordPress 5.0. Developers of plugins such as WPML or Yoast recommend not to update WordPress to the latest version, as many things may still not work. The reason is that there wasn’t enough time to test all the changes in WordPress itself, and the constant patches to Gutenberg only made it worse. This problem was raised by Konrad Karpieszuk on dev.wpzlecenia.pl. Not much time has passed and we already have a version of WordPress 5.0.2 that fixes hundreds of bugs that have been found so far. Couldn’t they have been fixed before Gutenberg was released for production? The worst thing about it all is that the security fixes that were introduced in version 5.0.1, spoil the backward compatibility! Updates of this type should not do so. The worst thing is that the WordPress bug reporting system no longer fulfils its role. They have such a large number of reported and open bug reports that they lose themselves in it. At the time of publish for this post, there are 473 open tickets in the 5.1 milestone and 55 open tickets in the 5.0.3 milestone (most of which will be punted to 5.1 before the 5.0.3 RC is packaged on January 7th). We’ve been working with Gutenberg for a long time and through such constant changes and breaking with backward compatibility, we had to correct all entries on our blog dozens of times in order for them to be displayed correctly. How to switch off Gutenberg? Gutenberg’s bad popularity is indicated by the growing popularity of the plugin restoring the classic editor as it used to be in WordPress. A classic editor that replaces Gutenberg. 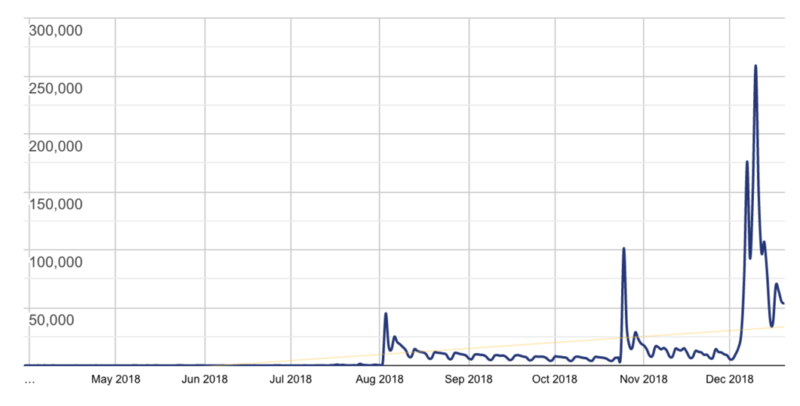 The number of downloads around the release of version 5.0 jumped dramatically upwards. And no wonder. When creating larger entries like our Compendium, Gutenberg is unused. Very often the browser stops responding, because it can’t cope with the number of blocks (over 250) in such an article. Statistics of Classic Editor plug-in downloads. The easiest way is to install the previously mentioned WordPress Classic Editor plug-in. This plug-in is developed by WordPress developers. Another plug may be Disable Gutenberg. It has a number of different functions, such as the ability to disable Gutenberg for specific user roles or individual entries. Looking at the way Gutenberg is created, the number of fixes that appear just after its release, I have the impression that the creators delivered a beta product to the market. Nothing. We look forward to a stable release!